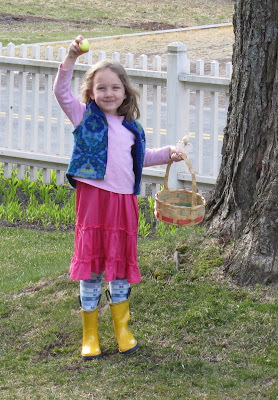 Pink shirt over hot pink dress, blue patterned vest, blue patterned tights, yellow rainboots, yellow egg! The rain boots totally make it. I've heard you should always match your egg to your shoes. A flattering spring layered look. Other children look on in envy and wish they had her style! Much more practical than the ball gown my child wore for egg hunting. My Emily would put on the same kind of outfit. It's creative thinking at its best! Still feeling that Betsey Johnson thing...Miss M is a beautiful and sparkly one! I think she's just about got the spectrum covered! I always thought Easter was the most colorful holiday! Love it. I agree with the others the boots totally make the outfit. Very festive. Mine refused to wear a skirt--she was for sure the only little girl at church not wearing some kind of pastel confection. She's got all the Easter colors covered---except for m maybe green. I want a pair of those yellow rainboots! Your daughter is lovely. Gorgeous! All she needs are bunny ears, but in what colour? i think my daughter wants those boots. daughter is 20.
we've appropriated the idea for a little blog project my daughter has going on with another blogger's daughter of the same age in minnesota. we figure it's a good way for them to learn a bit more about what it's like in their respective countries! I love that kid. KayTar has a GREAT love for her rainboots, too. I used to tell my daughter, when she was dressed in a like manner, "You are a joyous riot of color." That smile is brighter than the colours on her body. What a lovely girl. what a doll! she dresses better than most groovy girls!